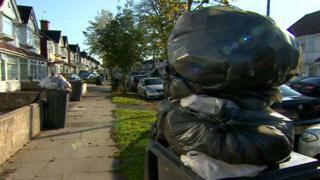 Birmingham City Council has failed in its bid for an injunction to stop bin workers taking industrial action. Unite and Unison union members started a series of walkouts over "secret payments" made to non-striking GMB staff after a dispute in 2017. The council had claimed the action was "unlawful" but a High Court judge said it was likely the unions would succeed in defending it at trial. Unite said it will postpone strike action on Monday to enable talks. The unions and Birmingham City Council have been in a dispute since December over claims that GMB union members, who did not take part in previous strikes in 2017, had been given extra payments by the council. Mr Justice Freeman rejected the council's contention that it had a "proper legal justification" for making the payments to GMB members. Unite assistant general secretary Howard Beckett said the council has been more interested in trying to secure the injunction than "putting right the wrong of secret payments". Unite and Unison members are currently striking two days a week, but Unite is also balloting members for further industrial action, claiming the council is sending out bin lorries without the appropriate number of staff. Mr Beckett called on the council to "do the right thing, end the disparity and so end the dispute". Councillor Brett O'Reilly, said the council "didn't want to end up in court" but said after its last offer was rejected, it was left with no choice. He said the offer remains on the table, but is conditional on all current litigation and industrial disputes being brought to an end.